When it comes to refrigerators and freezers in your restaurant, time is money when there is a problem. If your unit is having issues and cannot keep your food at the right temperature, it can spoil quickly and can become a nightmare for your wallet. Luckily, Beach Air is around to take care of any commercial refrigeration service that you may need. 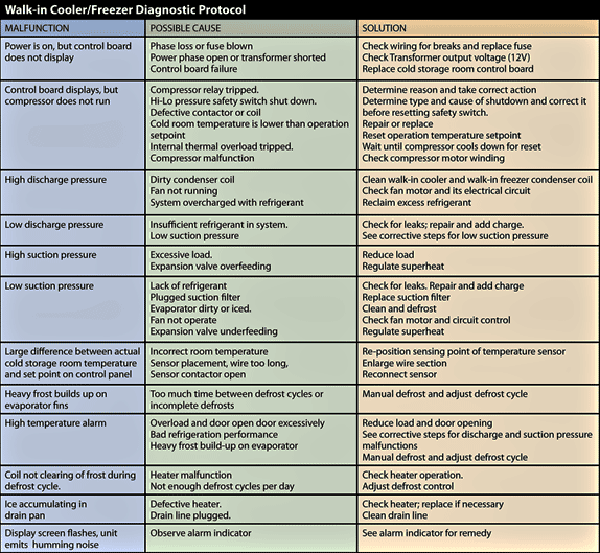 If you experience any refrigeration problems with your walk-in cooler or freezer, use the chart below to try to determine the issue. If you cannot figure out what's wrong yourself, please don't hesitate to give us a call at 843.796.3798.